Come let us take you one of the most fabulous plantation tours in Jamaica, take a picturesque ride to mountain side of Montego Bay, come capture the true spirit of Jamaica, journey to the interior of the island for an exiting adventure, view the majestic mountainous country side, enjoy lush vegetation, wild flowers and trickling waterfalls. A working coffee and pineapple plantation located at the base of the Catadupa Mountains. 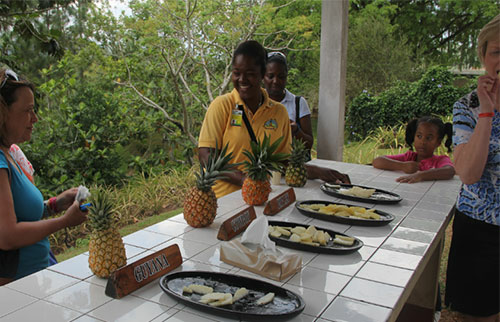 Sample the delicious tropical fruits and enjoy a delicious Jamaican buffet surrounded by lush green mountains. This is one tour you won't want to miss during your holiday in Jamaica and one that you will truly enjoyed. Capture the spirit of Jamaica as you travel inland for a rural adventure into the island's majestic mountainous countryside. As you journeyed you will reach the beautiful Croydon Plantation, the birthplace of National Hero Sam Sharpe, the famous slave leader behind the bloody Baptist War slave rebellion which took place in Jamaica in 1831. Croydon Plantation is nestled in the foothills of the Catadupa Mountains, just a short drive from the tourist capital of Montego Bay, we promised that the views here will take your breath away. Picturesque mountains, lush vegetation, wild flowers and waterfalls are just some of the highlights of this tropical paradise and you will have opportunity to take some beautiful photos to take back home. Your local tour guide will lead you through the working part of the estate and talk you through the history of the plantation and describes the crops they produce. On the way, you can taste exotic seasonal fruits such as pineapples and other citrus fruits, in addition to other crops such as jackfruit and sugarcane. As you walk through the coffee groves, your guide will also explain the techniques of cultivating coffee and the processing methods as he takes you through working demonstrations. As you may be aware, coffee is one of Jamaica's biggest exports, and the island produces some of the best in the world. This three-hour tour is a fascinating way to learn about Jamaica's agricultural methods and principle produce. Afterwards, enjoy a delicious Caribbean barbeque lunch served with the world-famous Jamaica Blue Mountain Coffee. Sit back and enjoy the breathtaking views as you relax in this tranquil paradise, surrounded by tropical trees, mountains and countryside. A visit to Croydon Plantation is a must for travellers looking for the real Jamaica. Yeh mon! Our driver Andrew was very courteous and very resourceful. the tour was awesome, the fresh fruits was very tasty, the guide was very engaging and informative, this is a huge plantation. I will recommend this tour to anyone visiting Jamaica and need great experience.